"Growing up in Morogoro, the news about an International non-profit organization partnering with Sokoine University of Agriculture spread quickly amongst the residents of the small town. I was completing my grade seven exams when I first heard snippets of APOPO’s work. Although I didn’t quite understand why rats were used or what exactly ‘land mines’ were, I loved the fact that APOPO was exploring unconventional ideas in science. Fast forward six years later, I had graduated from high school and was heading to the University of British Columbia under the International Leaders of Tomorrow award to pursue a science degree. During my first year at UBC, I was enrolled in the competitive ‘science one’ program that exposed me to upper year laboratory techniques through which my curiosity for science and research blossomed. At the end of my first year, I reflected over why research in science excited me. I came to realize that I was fascinated by the labyrinth of searching for the unknown in science and seeing the results manifest in a direct or indirect solution that betters the lives of people. This prompted me to apply to intern for APOPO’s Tuberculosis detection program in Tanzania. Health economics: For non-profit organizations, external funding translates into transparency within the institution’s activities. I contributed to a costing exercise to identify costs for each additional TB case detected by APOPO and other research projects, which may influence the future direction of the program. Data analysis: My research into numbers of TB cases found and project costs generated chunks of data that when disentangled morphed into meaningful conclusions. I estimated that APOPO spent roughly 200 € overall costs per additional TB case detected in Dar es Salaam in 2017, which appeared to be cost effective compared to information I found in published literature. However, case finding approaches can be very different and further investigations, also of unpublished information, are necessary. Soft skills: Over the span of three months, APOPO has equiped me with the skills necessary for working in this fast paced enviroment. I was fortunate to attend a training session conducted by facilitators from the National Tuberculosis and Leprosy Program, the Central Tuberculosis Reference Laboratory (CTRL) and the National Institute for Medical Research (NIMR) alongside APOPO’s TB Tanzania team. Visiting APOPO’s Dar lab, I learnt about the journey of the TB sputum samples from clinics to the HeroRATS evaluation room and laboratory countertops for confirmation. In addition, being supervised by Dr. Lena Fiebig provided me with a chance to practice effective communication of scientific results. Despite my internship revolving mostly around literature review and data analysis, I witnessed firsthand my colleges working with the rats who helped detect missed-positive TB samples. 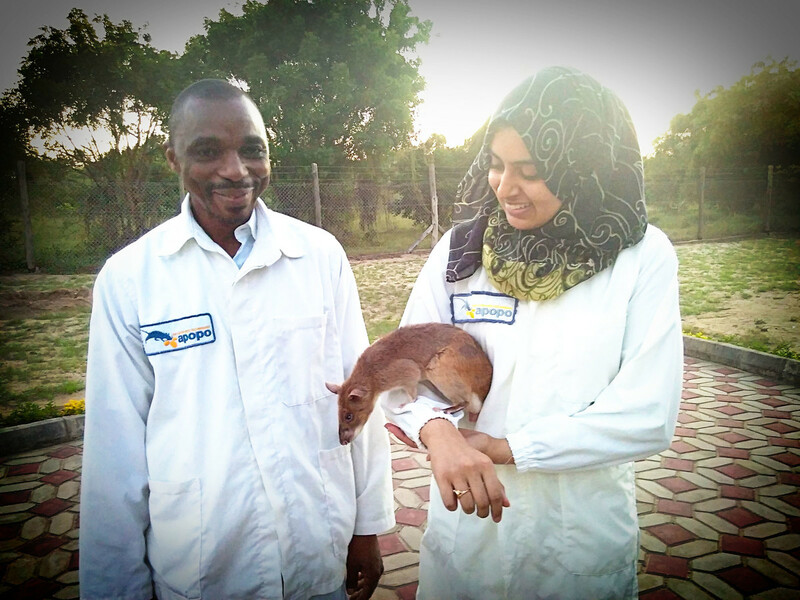 APOPO’s use of giant African pouched rats as a second line screening, followed by internationally approved confirmation tests, has increased the detection of TB by 40% in the partner clinics thereby deeply impacting the lives of Tanzanian citizens. I believe that working with APOPO has broadened my perspective on the field of R&D; and has cemented my passion in studying neglected tropical diseases in Africa. I hope to carry on the skills I have learnt at APOPO as I pursue my degree in Global health & nutrition at UBC with the hope of someday returning to work in Tanzania." APOPO TB Tanzania is most grateful for the support and generous contributions of its partners and donors.